While editing an article in Mayflower Descendant, a question came up about the way the testator referred to one of his children in his will. Along these same lines, a grandchild was included in the will who seemed to break the pattern of the way the testator identified everyone else in the family. The will in question was Nathaniel Brown (1735–1818) of Williston, Vermont. Born in Killingly, Connecticut, he was in Douglas, Massachusetts, in 1778, before moving to Vermont by 1802. Nathaniel and his wife Abi had twelve children, six of whom survived childhood and were identified in some context in the 1818 will of their father. Several grandchildren were mentioned in this will, including one grandson called “William Leonard Brown.” At first, when piecing out the family, this legatee was assumed to be the child of Nathaniel’s eldest son John Brown; John’s youngest child, William Brown (1795–1882), lived in Williston. However, as we reviewed the documents, this assignment was called into question. For one thing, this William Brown is found in numerous documents, but other than this will, he is never given a middle name or middle initial. Further, the language in Nathaniel’s will indicates this grandson is not yet twenty-one years old, and this William Brown would have been twenty-two! Further, it appeared that all of Nathaniel Brown’s other grandchildren mentioned in this 1818 will were named because their parent was one of Nathaniel’s deceased children, and this William Brown’s father John Brown was still living. To reiterate, the only grandchildren mentioned in Nathaniel’s will were offspring of his deceased children, and in cases where a child of Nathaniel was living, none of his or her children were mentioned. This last point was somewhat confusing at first, in part because many of Nathaniel’s children used the same names for their children – one grandchild was named “Abi Brown,” which initially appeared to be Abi Brown, born in 1801, the daughter of Nathaniel’s son Elijah. However Elijah Brown was still living in 1818. 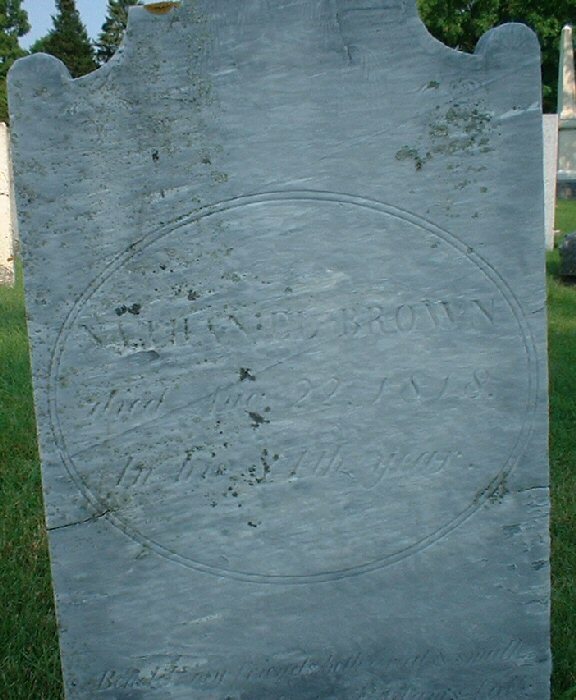 We later figured out that this granddaughter “Abi Brown” was Abi (Morse) Brown, born in 1792, a daughter of Nathaniel’s deceased daughter Rebeckah (Brown) Morse. To reiterate, the only grandchildren mentioned in Nathaniel’s will were offspring of his deceased children, and in cases where a child of Nathaniel was living, none of his or her children were mentioned. We had pretty complete genealogical summaries for five of the six children, with the exception of youngest son George Washington Brown (born in 1777), who was mentioned in his father’s will. Could this William Leonard Brown be a son of this youngest son? Possibly, but then why was George’s son mentioned if his father was alive? George Washington Brown married Eunice Brown at Douglas on 23 June 1796. Eunice was the daughter of John and Abigail (Reed) Brown, another Brown family of Douglas. This is the last vital record for George. However, thinking something was amiss, we took another look at the Browns of Douglas. In a deed headed “John Brown vs. Washington Brown” on 25 March 1799, Washington Brown seems to owe his brother John Brown about sixty-four dollars. His property in Sutton, Massachusetts, is seized and appraised at forty-six dollars. The sheriff in the case was Abel Morse, their sister’s husband. John Brown then sells this land to his father Nathaniel. 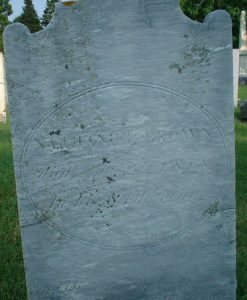 George’s father-in-law John Brown died at Douglas in 1813. In his administration, dated 31 May 1814, his daughter Eunice is referred to as the eldest daughter and “since Dead [leaving] her only son William Brown a minor heir to her part.” Welcome Whipple signs as the guardian of William Brown. It would appear likely George was not living in Douglas or Vermont by 1818, and family members may have not known if he was alive or dead – or just not financially responsible. These documents leave it ambiguous as to whether or not George Washington Brown was dead by 1814, when he is referred to as late of Douglas in his son’s guardianship papers. While mentioned in his father’s will, George is only absolved of his current debts and not left any additional monies. Further, George’s son William Leonard Brown is provided a legacy, while all of the other grandchildren mentioned in Nathaniel’s will are the heirs of his clearly deceased children. It would appear likely George was not living in Douglas or Vermont by 1818, and family members may have not known if he was alive or dead – or just not financially responsible. The article this relates to is “The Family of Nathaniel and Abi (Leonard) Brown of Killingly, Connecticut; Douglas, Massachusetts; and Williston, Vermont: A James Chilton Line,” by Peter J. Michelson. His birth is recorded as Washington Brown, but he is later called George or George W. Brown. Worcester County Deeds, 136: 431–33, 149: 225. Worcester Probate Records, #8114 (available on AmericanAncestors.org). Will of Nathaniel Brown, 1818, Chittenden County, Vermont Estate Files, Box 4, File n. 49[8? ], 7: 207 (online at ancestry.com).